DID YOU PULL ONE OF THESE CARDS? Then you got shorted. These are supposed to be an ‘additional hit’ inside boxes of 2012 Topps Tribute. On March 9, 2012 Topps implemented a redemption program. Send in your Tribute to the Stars Autograph – and get a free pack of 2011 Bowman Sterling Baseball – that will have 2 autographs and 1 jersey card – for free – along with your card back. Offer expires March 9, 2013. 2011 Topps Tribute will feature a slightly different vibe when compared to the 2011 set. 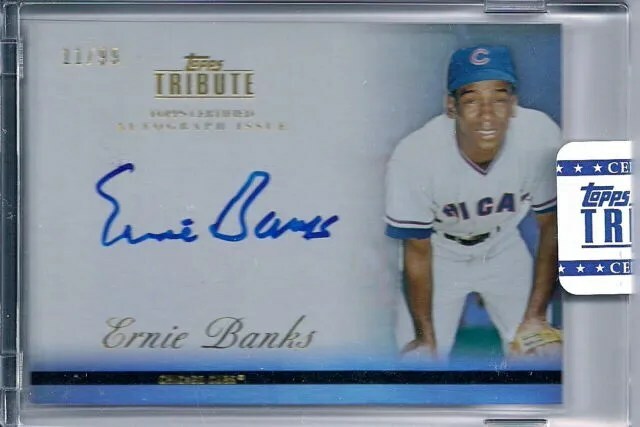 It appears as though Topps will focus on obtaining as many on-card autographs as possible instead of book cards and autograph relics with stickers that were heavily featured in 2011 Topps Tribute. Look for the secondary market sales of the 2012 on-card autographs to be strong but be wary of purchasing a full box at around $250 a box. Typically these boxes are very hit or miss and it is quite a gamble to spend that kind of money on a box of trading cards. Look to pick up singles cheap on eBay or your favorite venue of choice to buy sports cards. The base set and the on-card autographs look very similar to the design of 2011 Topps Marquee – which isn’t such a bad thing considering that set has nice eye appeal. The stated odds of 3 autographs and 3 jersey cards remains the same in 2012 Topps Tribute Baseball – but look for the set to release before the 2012 baseball season this year around. In late February 2012, Topps announced that they will add 100 buyback autographs of Hank Aaron. In addition, every autograph and relic card in 2012 Tribute will be encased and have a Tribute Sticker sealing the card holder.